Members of Spark! Creative Artspace are pictured during last year’s Greene Countrie Towne Festival Parade. With the 2015 installment of the Greene Countrie Towne Festiva, there are a few changes, but for the most part attendees can expect the traditional festival fun brought to the community by the Greenfield Rotary Club. On Friday, July 17, opening ceremonies are set for 4:30 p.m. The queen’s pageant, typically held at McClain High School on Thursday night, will this year happen on the festival stage on Friday. It’s set to begin at 5 p.m. with Highland County’s own Eric Huff to entertain attendees after the pageant at 8 p.m. The festival royalty will be announced after Eric Huff’s performance. On Saturday, the day will begin with the annual baby contest. Forms are available at Edgewood Manor and at greenfieldrotary.org. The deadline to register is noon on July 17. For more information call 937-981-2165. Also on Saturday, festival goers will have the opportunity to take part in the contests of the day, which will include the popular lip sync contest held on Sunday in previous years. Attendees on Saturday can also enjoy various entertainment at the stage, see the antique tractors and the classic car show, watch the kiddie tractor pull, witness the slight of hand of Boonie the Magician, and take part in the annual Rotary auction set for 1-3 p.m. The auction is the largest fundraiser of the year for the Rotary Club. Through the years the auction has raised hundreds of thousands of dollars that have been funneled back into the community through various endeavors. Those wishing to donate items for the auction can drop them off at The Letter Shop at 247 Jefferson St. in Greenfield. Saturday’s late-day musical performances will begin with Rock N Country from 4:30-7 p.m. and headliner McGuffey Lane taking the stage at 8 p.m.
Slated for Sunday is the Modern Movement Dance Company, set to perform from noon-2 p.m. Scheduled to follow is the festival’s annual parade at 2 p.m., and the introduction of visiting royalty following the parade. In honoring McClain High School turning 100 years old in September, Edward Lee and Lulu McClain, portrayed by Danny and Susan Long, will serve as parade grand marshals. Line-up for the parade will be at 1 p.m. at the Research parking lot between Eighth Street and Edgewood Avenue. Anyone wanting to participate in the parade can get the application from Rotary’s website (greenfieldrotary.org), Southern Hills Community Bank, both Greenfield locations of Merchants Bank, or Community Savings Bank in Greenfield. Return completed applications by contacting Andrew Surritt at 740-572-6737 or Angela Shepherd at 937-763-3674. Applications can also be dropped off at the main branch of Merchants Bank or emailed to a.shepherd726@gmail.com. Local band Dumbfounded will close out the festival weekend with a performance beginning at 3:30 p.m.
Festival staple Rockin’ Ron will be set up near the post office on Friday, July 17 from 7-10 p.m. Vendors and carnival rides will also be open for the July 17-19 festival weekend. The beer garden will be open for patrons July 17-18. For questions, call Angela Shepherd at 937-763-3674 or Chuck Miller at 937-760-2898. For more information about this year’s festival, to obtain a schedule, or to learn more about the Greenfield Rotary Club, go to greenfieldrotary.org. Photo: Members of Spark! 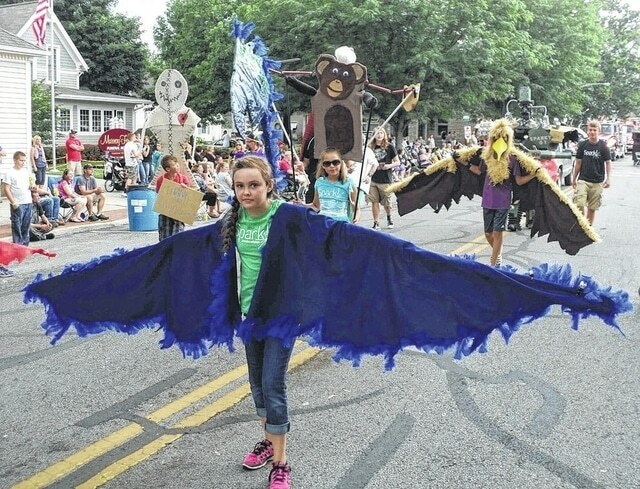 Creative Artspace are pictured during last year’s Greene Countrie Towne Festival Parade.